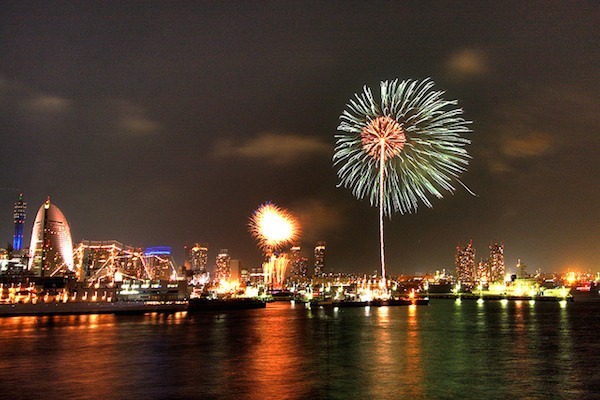 Night Photography tips for beginners: 5 tips to shooting Fireworks - applicable to low light scenes. This holidays many of you will find yourselves out trying to capture firework shots and festive images of the lights and sparklers on display. Follow along with our guide to make sure you won't miss a shot. Instructions are split for shooting in automatic or in manual mode, so make sure to choose the mode most comfortable for you. In Automatic mode: Follow these steps to correct for this and other common Auto mode restrictions. Step 1: Be sure to set your camera to the “no flash” setting. 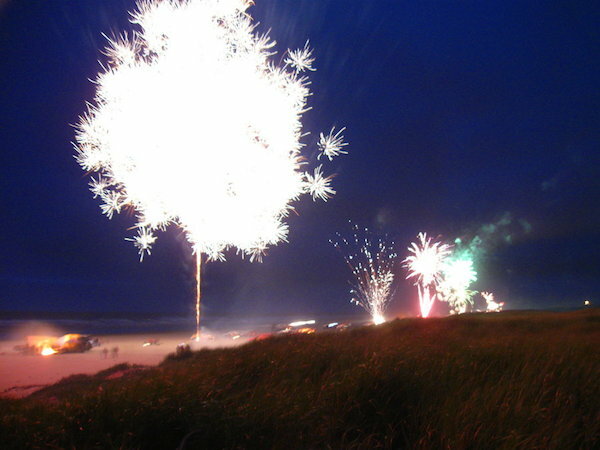 The fireworks are too far away in the sky for your flash to be able to light them, and the flash will illuminate other parts of the scene you may not wish to highlight. Assign a “scene” mode if you have that option. 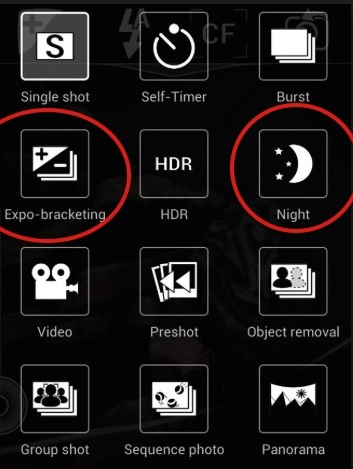 Many cameras will have a “night time” or “fireworks” setting built in to their auto modes. These are automatic functions that instruct the camera to cancel out the flash and compensate for the dark conditions. 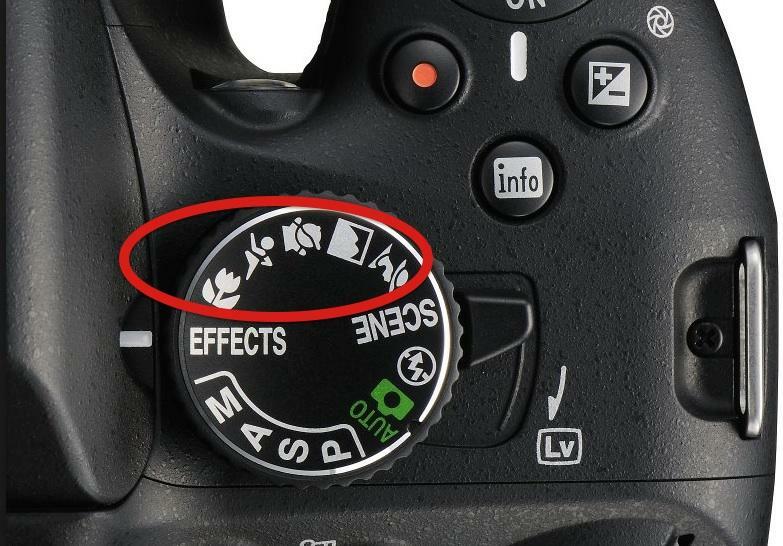 These modes will not only cancel the flash but also will instruct the camera to adjust exposure correctly. The exact name of the preset will vary depending on your camera model. There are other similar presets called "Dusk", Night Portrait, or anything that indicates darkness. Consult your camera’s manual ahead of shooting to make sure you know where to find this setting on your camera. If possible, do a test ahead of time on your different auto mode settings to find the one that works best for you. Step 2: Check your metering mode. If your camera allows you to adjust your metering mode your best option will be to select the evaluative or average setting. By default the automatic modes on your camera will evaluate your scene as a whole and adjust the exposure for an average overall brightness. 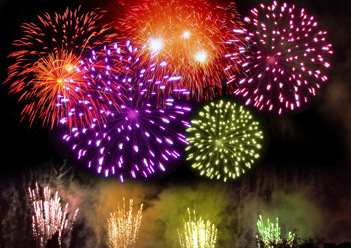 Depending on your composition, if the fireworks only fill 1/3 of your scene, remaining 2/3rd of dark sky in the surrounding area will cause your camera to overexpose your image, resulting in fireworks that are washed out. 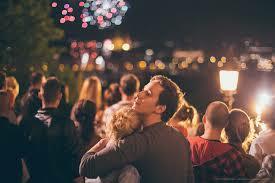 Try the Spot meter, if available and aim the center (focusing area) at the fireworks. Step 3: You can further adjust your exposure using the Exposure compensation option, "EV" or "Bracketing", to control the overall brightness or darkness level of your scene. This is how you can make up for your camera’s predisposition to overexpose in low light. The "EV" setting will allow you to darken or lighten your overall image by 1 or 2 stops. (-1, or "-2"). 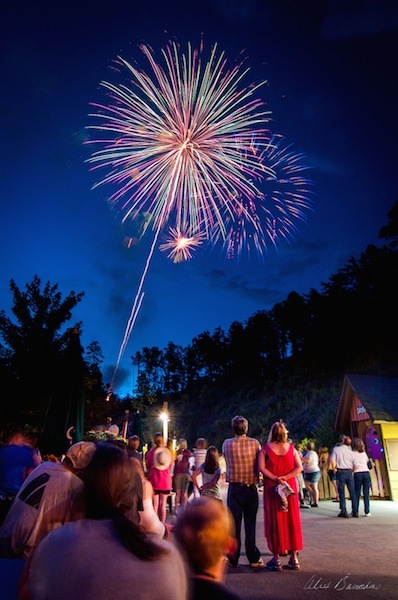 Step 4: Be cautious of your framing, the fireworks will be scattered throughout the sky so be sure to frame in such a way that you’re able to capture the scene you want while still getting the fireworks in the frame. Adjust your camera’s zoom, or switch to a horizontal or vertical composition to find the option that works best for you. Step 5:: Reduce camera shake as much as possible. Most cameras will increase the ISO in night modes to levels that will produce Noise. If you override this setting you’ll want to be sure to have a tripod or setup where you can place your camera to stabilize the exposure. You can use almost any object as a tripod: lay the camera on a fence, bench, or anything static that you can find. Review your images after the first few shots to make sure your settings are correct. If you do have camera shake your final image will be distorted similarly to the image below. 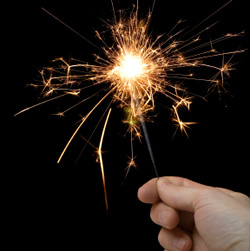 ---Tip: Plan ahead – bring sparklers with you and ask a friend to play with them while you photograph. 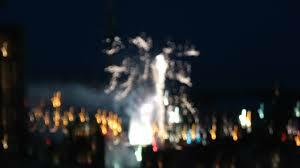 This is a great way to test the exposure settings on your camera and get a feel for how to shoot the fireworks. Be sure to do these tests just before the fireworks so that there is no change in the overall light level of your scene. Photographing in manual mode will certainly provide you more options, but may slow you down if you’re not comfortable with all of your settings. If you’re just starting out in manual mode be sure to test your settings prior to the big event. See our tip above to help you gain control of your camera’s manual features. In brief there are three settings that control exposure. ISO, Aperture, and Shutter Speed. The camera in automatic alters these three, or a combination of all in order to get the right exposure. ISO: This is the equivalent of the canvas selection for a painting. ISO controls how sensitive your camera is to light, but with higher ISO’s you’ll begin to see small grains form in the image, often referred to as noise. Noise will alter the overall look of the image, so be sure to choose this setting carefully. ISO can be low for bright scenes (i.e ISO 100), and High for dark scenes (i.e. 1600). If you’re shooting without a tripod you’ll likely want to choose an ISO above 800. If you are shooting with a tripod a lower ISO of 400-600 could also be acceptable. Shutter Speed: This is the duration your camera’s shutter remains open to make each exposure. For bright scenes this is often 1/60th of a second or faster. For dark scenes, this might need to be slower anywhere from 1/30th of a second to 1 or 2 seconds. Pros and Cons: Any photo shot below 1/60th of a second without a tripod will likely look blurry from camera shake. 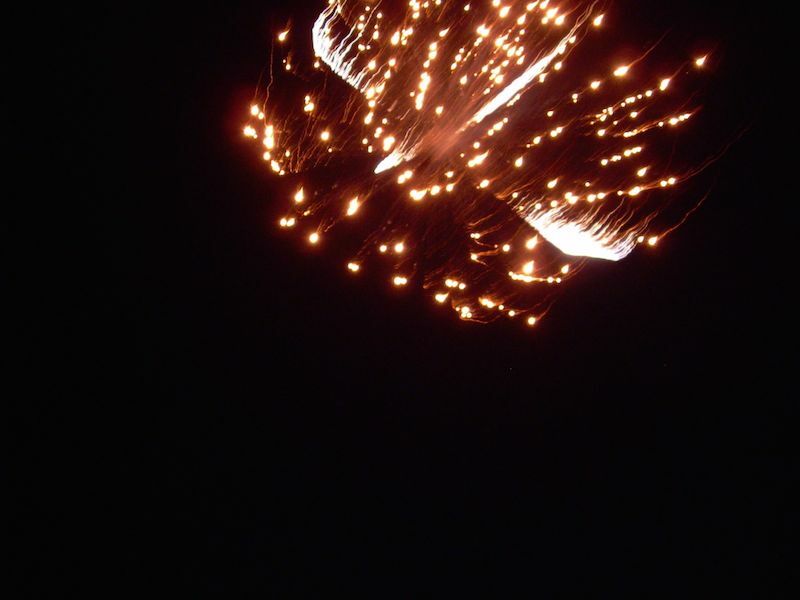 When photographing fireworks, using a shutter speed faster than 1/60 th of a second will freeze the fireworks as they are, resulting in short, stippled lines of light. Photographing with a shutter speed longer than 1/60 th of a second, and the individual light streaks of the firework will begin to bleed together and create more fluid looking lines. Your shutter speed is the factor that will most effect the texture of the firework in your image so be sure to choose an option suitable for the look you want. F-Stop / Aperture: This is the equivalent of the eye’s pupil. It is how light enters your camera through your lens. When it’s bright it should contracted, and when it’s dark it should expand. Aperture will also effect your image’s depth of field (how much is in focus in your image). Pros and Cons: Wide apertures create a background blur. Small apertures produce full sharpness. If you want your entire scene to be in focus you’ll need to use a smaller aperture. At a wider aperture you’ll risk getting blur where you didn’t want it. 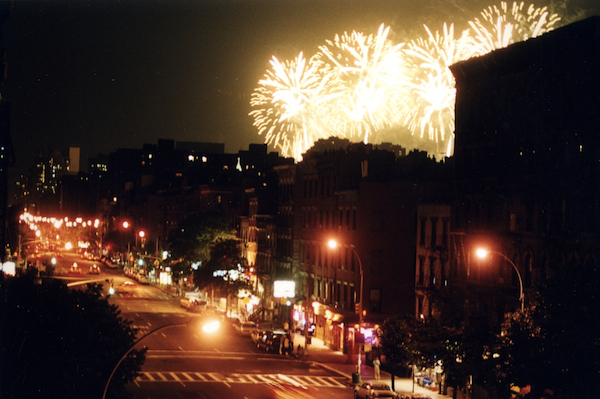 Be sure to post your firework images to our PhotoManhattan Facebook wall. For more tips and tricks on photographing in low light, consider signing up for our special Night Photography Field trip. For exposure, motion blur effects, and Freezing motion, consider our Digital Photography I course.